Polyp 0116, originally uploaded by Buck Cash. Okay, so today I had my first ever colonoscopy. Seeing as how I'm 54 years old, it's a common thing for guys my age anyway, but mine was triggered by something spotted on my recent PET scan, which was a follow-up to my Stem Cell Transplant for my Non-Hodgkin's Lymphoma. Anyway, prep for it started yesterday, when I went on a liquid diet at about noon. At 11:PM I took 3 Dulocolax/Bisacodyl tablets, sold off the shelf at Walmart. At 6:AM this morning I started drinking a mixture of lemon-flavored Gatorade and Miralax. Over the course of 3 hours, I drank 96 ounces of Gatorade mixed with 357 grams of Miralax. The rest of my morning was spent running to the bathroom to vacate my colon. Over and over. And over. All in all, it wasn't too bad at all. I like Gatorade, and the Miralax didn't seem to do much to the flavor. It was just quite a bit more in a 3 hour period than I was used to, and of course the many bathroom breaks because of it. At 2:PM, I showed up at the hospital, filled out a form, and they ushered me right in and had me change into a hospital gown. Then I got onto a gurney, got an IV installed, and got wheeled into the room where the procedure was to be done. A nurse shot a little something into my IV port to get me relaxed, and the doctor explained what to expect. I was rolled over onto my left side, knees pulled up towards my chest, and I could see what they were seeing on the big monitor I was facing, which I found pretty interesting. They found and removed 3 polyps. One was the size of a golf ball, and I heard the doctor tell the nurses, "You might see one this big every 25 years." After removing it, he placed two metal clips to stop the bleeding on a severed artery, and that pretty much wrapped it all up. The photo is of my golf ball sized polyp before we went our separate ways. All in all it went pretty well, and it went really easy. The doctor said to have another colonoscopy in about 5 years, add fiber to my diet, and have a great day. I guess that's about it till next time! Egg Coloring 3280, originally uploaded by Buck Cash. Went to see the Doctor on Wednesday to go over the PET Scan results. To get straight to THE point, no cancerous activity spotted, so the remission is ON, BABY! It did show a couple other areas of activity though. One was my sinuses, which are showing a bit of activity. I've been having what seems like hay fever / pollen type symtoms for about a week now; Watery eyes, sneezing, lots of mucus, etc. Anyway, Doc gave me some antibiotics, just in case, and I'm taking Claritin to dry up the sinus a bit. 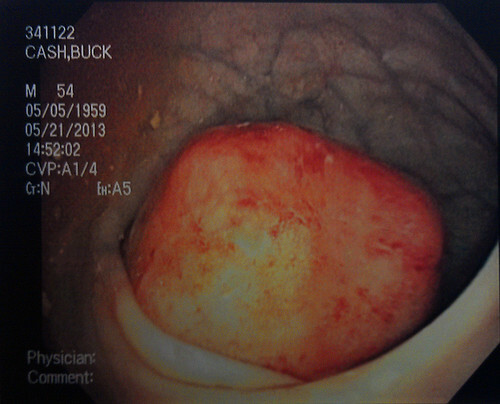 It also showed that I have a single gall stone, but it's calcified already, and probably won't give me any trouble. I've got a couple of infusions to do. First one is on May 15th and the next is on June 12th. I don't even remember what I'm being infused with, but it's to boost something that's still a bit low. I'll update with full details when I get the first on on the 15th. I'm scheduled for a visit to Karmanos in Detroit on June 5th for a visit with my Doctor there doing a follow up on the Stem Cell Transplant. I expect that will go just fine. I checked the Henry Ford IMAX schedule and found that the new Star Trek movie will be playing there in 3D, so I'm definitely planning to take that in while I'm there. Also I'll be scheduled for a colonoscopy soon because of something really small and pretty insignificant that showed up in that area. Doctor's not terribly concerned about it, but we'll take a look just to be sure because of my age. Speaking of age, I just had a birthday. 54 and still going strong here! That's about it for now! Will update again when I have more. 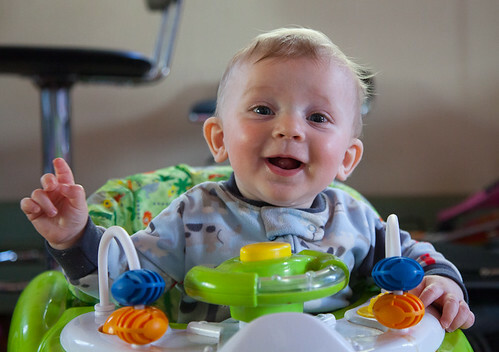 Oh, and the photo is of my grandson, Michael, just being his happy self. 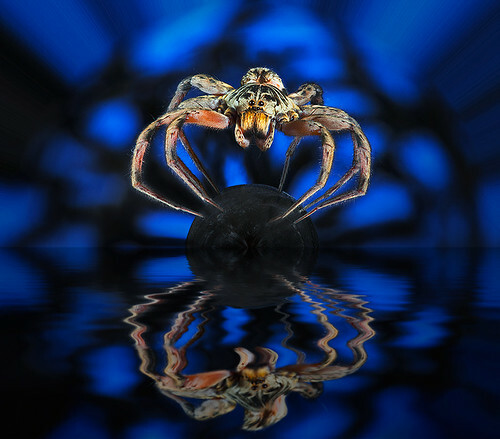 Stranded Spider 2282, originally uploaded by Buck Cash. Well, here we are a couple months after my last post. Not much has happened medically in that time, until yesterday, when I had another PET Scan. It's an easy procedure; Go in, get an IV, they inject the radioactive isotope marker into the bloodstream, give you a blanket and turn out the lights so you can nap for 90 minutes while it goes to all parts of your body, then wake you up, scan you in the big donut machine for about 20 minutes, and you're on your way. I'll have a visit with my doctor next Tuesday to review the results of that scan. Other than that, I moved into my own place, which has a nice big studio space I can work with, so that's pretty cool. Casey, Gracie and Michael have been staying with me while she looks for a job and her own place in the Petoskey area. I've been selling off a bunch of stuff I no longer use on eBay and that's giving me a little extra cash and helping me do a little spring cleaning. And speaking of spring, THE SNOW IS FINALLY GONE!!!!! WOOOT!!! I probably shouldn't get too excited. It's only the beginning of May and I'm in Northern Michigan - We could get a blizzard tomorrow! LOL! Anyway, all's good here, as far as I can tell. A little congested the last couple of days, but my mom says it's all the pollen this time of year. LABS next week when I go to see my doctor should tell if it's anything else that needs to be dealt with or not.